India’s captain Virat Kohli celebrates the dismissal of England’s Jonny Bairstow at the third One Day International at Eden Gardens in Kolkata, Jan. 22. India’s opening batsmen have come under fire for poor starts in their last two home series against New Zealand and England but captain Virat Kohli says now is the time to give them support not show them the door. The hosts defeated New Zealand 3-2 and won the three-match ODI series against England 2-1 but there was not a single 50-run partnership at the top of innings. While 49 was the highest opening partnership between Rohit Sharma and Ajinkya Rahane in the five ODIs against New Zealand, India’s first-wicket stands against England were 13, 14 and 13. Lokesh Rahul played all three games against England, scoring eight, five and 11, while partner Shikhar Dhawan managed one and 11 before making way for Rahane, who was out for one in the Jan. 22 third ODI in Kolkata. India have no more 50-over matches scheduled before they defend their Champions Trophy title in England in June but Kohli is confident the problems will be sorted out by then. “Whatever areas or concerns we have, we’ll address them,” Kohli told reporters. “First we didn’t have an opening problem, it was an issue with the middle order. Now the middle order has been sorted. Injuries have compounded India’s opening issues as the team have been unable to give an extended run to a batting pair. 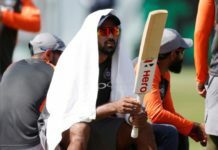 Sharma has not played any cricket since hurting his thigh in the final ODI against New Zealand at the end of October while Rahul and Dhawan missed the series against the Black Caps with injuries. Sharma, who holds the record individual ODI score of 264, is expected to return to face the new ball during the June 1-18 tournament but India would have to take a decision on who would partner the right-hander. Despite the lack of solid starts, India were still able to score over 300 runs in all three ODIs against England and Kohli would rather focus on the positives. “The Champions Trophy (in 2013) is where we saw Rohit Sharma and Shikhar Dhawan as an opening-pair revelation,” Kohli said.